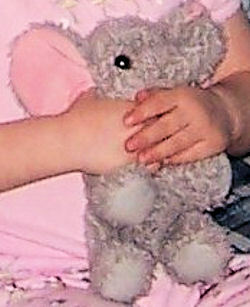 I am searching for an stuffed elephant that was my daughter’s FAVORITE animal of all time. I never measured the animal, so I am guessing that she was about 6 or 7 inches tall. She was a standing elephant with no tusks, and the insides of her ears are pink. She did not contain any beads. I believe she was made for and sold at Walmart. We cannot remember the exact dates on her tush tag either, but may be about 2001 or later. She was not furry, but more of a matted? material. It stood on all four legs, like a real elephant would, and the legs were not long enough to be able to sit. It was a pure gray color. We think it was lost at a hotel in Cortland, NY, but the hotel never found it. She has had so many sleepless nights since losing her, and I have searched everywhere imaginable. It was not an expensive animal, just a precious one. I would be so grateful if anyone knows where I may find an elephant like this. Nothing has been a good enough replacement for my daughter, and she is just heartbroken. Ebay #160509218243 stuffed animal plush 8″ ELEPHANT aurora Worth a look new with 4 available. Hope this helps some. if these are similar of anything has come back to mind give us an update. Update: We still have not found “Bella” the elephant. I am starting to believe that she was one of a kind. Have second guessed where she was originally from so have searched EVERYWHERE! Thanks Carrie for your comment. The little Aurora brand elephant is pretty close, but Bella was a bit larger and was not bean filled. We did buy a little Aurora elephant and told my daughter that it was Bella’s baby. She has taken Bella’s place as her favorite, but she still misses the original so we are still searching. If anyone finds anything that matches the description of Bella I would love any new leads! Thanks so much!